It's beginning to look a lot like Christmas in the Sierra and it isn't even Halloween yet. It's not even November and people are already hitting the ski slopes of Tahoe thanks to an early season snowstorm. Boreal Ski Resort will open Friday and Squaw Valley opened the chair lifts today following nearly three feet of snow since the weekend at higher elevations. Thursday's opening at Squaw is the earliest for the resort since 1960. Even the lower elevations such as Tahoe City reported getting about a foot of snow. With 3 storms in 3 days the Bay Area has had a decent amount of rain which held up and turned into some major Sierra snow. With totals ranging from 1 to 3 feet this was even more than road crews could handle leaving some stuck in the Sierra. This even included NBC Bay Area's very own Vicky Nguyen who shares her "snowed in" video with Chief Meteorologist Jeff Ranieri. You need to be driving up there about now though if you want to do some skiing. 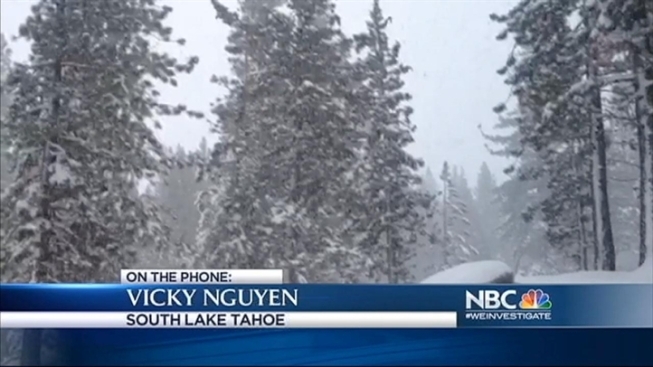 NBC Bay Area's Christina Loren said most of the snow will melt by the end of this weekend. Loren is also quick to add that there is another system that is heading that way next week, but says it is warmer and may produce slush not snow. The early snow is great news for all the Sierra resorts who are coming off the driest season on record. The first real snowstorm didn't hit Tahoe until January last season. Squaw Valley says it will officially open Nov. 21. That is the same date Kirkwood and Mt. Rose are scheduled to open. Heavenly and Northstar are set to open Nov. 16. Alpine Meadows is slated to open Dec. 7. Of course all that could change if the snowy weather pattern holds.